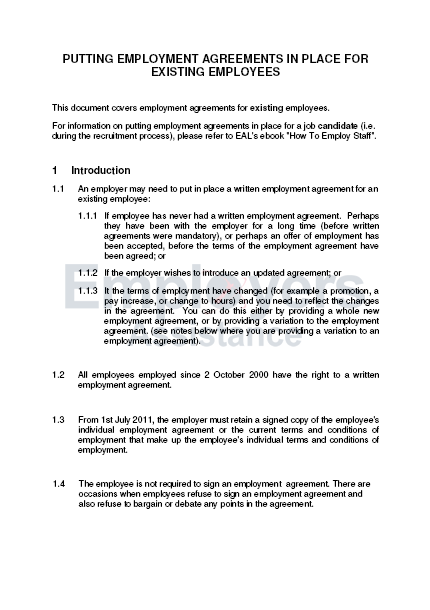 These document detail the process for putting employment agreements in place for existing employees and job candidates. It also includes suggested letters to be used during the process. 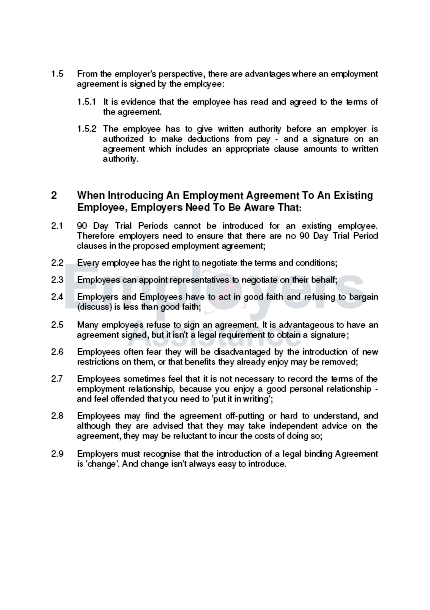 From 1st July 2011, the employer must retain a signed copy of the employee's individual employment agreement or the current terms and conditions of employment that make up the employee's individual terms and conditions of employment. The Law changes constantly as a result of Acts of Parliament and Court Cases. During the course of employment, Employees’ Position, Package, Hours of Work, Job Description etc. can change. Person who has accepted the job, but has not signed the employment agreement. Introducing a variation to an existing employment agreement. The steps to take if the employee refuses to sign. Details of Variation to existing employment agreement.